The AirSense 10 AutoSet CPAP is represents the latest evolution of advanced autotitration technology, and is the logical successor to ResMed's highly successful S9 line of CPAP machines. In fact, the S9 was so advanced and well-liked that it was hard to imagine that ResMed could improve on that design, but after looking at the new "A10" in depth, we think it is safe to say that they have succeeded. Featuring a sleek new design that easily blends in with your bedroom's decor, the AirSense immediately gives you a better bedside view of the color LCD display by placing it at an angle rather than flat as with the S9 series. The AirSense also offers built-in heated humidification with ResMed's tried-and-true HumidAire heated humidification system in a package that is nearly 25% lighter than the previous model. As with the S9 platform, you also have the option of the standard SlimLine breathing tube, or the ClimateLine heated breathing tube to maximize effectiveness of the humidifier without the annoyance of rainout. 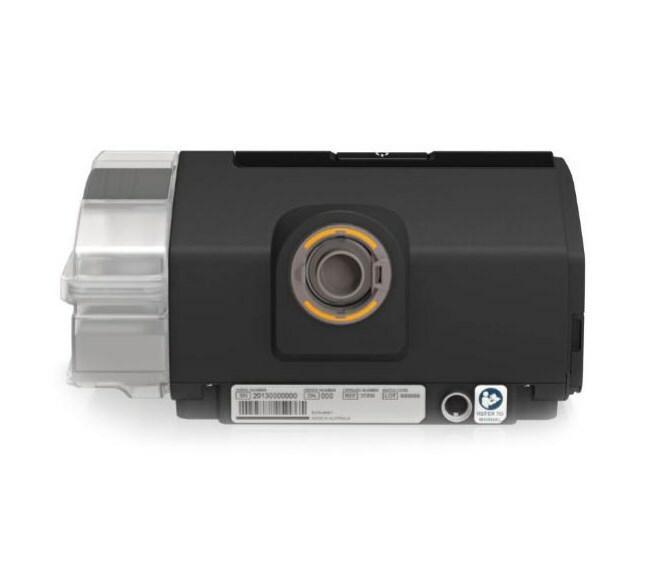 The AirSense shares the S9's whisper-quiet operation with the same highly refined Easy-Breathe motor to power the machine, which means no more restless nights trying to hide the din of a noisy CPAP machine. The AirSense™ 10 and AirCurve™ 10 devices have been designed to make therapy easy. With no complicated settings or menus to navigate, simply press Start and you™re ready to go. The new AutoRamp™ feature with sleep onset detection helps make therapy comfortable from the moment you turn on your device. AutoRamp works by delivering a low pressure to help you fall asleep with ease. Once it detects you™re asleep, it comfortably increases the pressure to ensure your prescribed level is delivered the moment you need it. No need to hit the ramp button multiple times when trying to fall asleep. If preferred, the machine can be set with a traditional ramp setting, or this feature can be disabled altogether. Every device has an ambient light sensor that adjusts the brightness of the screen based on the amount of light in the room. So if you get up during the night and need to pause your therapy, the screen will stay dim so it doesn™t disrupt your partner. The screen™s back light also turns off automatically to help you fall back to sleep without disturbance. Advanced AutoSet algorithm tailors the therapy pressure to the patient's needs by monitoring their breathing breath-by-breath. 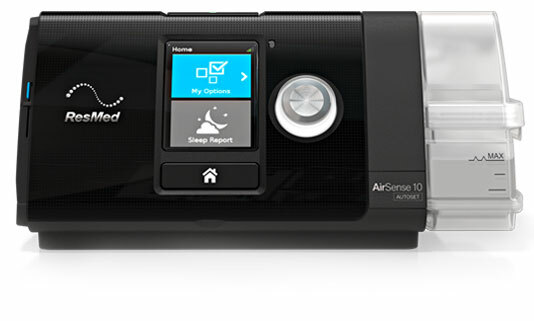 In addition, the AirSense 10 AutoSet™ for Her therapy device intelligently addresses the unique therapy needs of women with the first dedicated algorithm designed to treat mild to moderate obstructive sleep apnea (OSA) in female patients. AutoRamp starts machine at lower, more comfortable pressure, and gradually ramps up to prescribed pressure when CPAP senses that you are asleep. User-friendly controls, intuitive interface and color LCD screen make it simple to navigate menus and customize comfort settings. SmartStart™ function allows you to begin therapy as soon as you breathe into your mask. When you remove your mask, it stops automatically after a few seconds. HumidAir™ heated humidifier is built-in so you can enjoy the benefits of humidification in one easy-to-use system. If you want to travel light with no humidifier chamber, you can purchase the optional AirSense Side Cover and snap it in place of the chamber. Optional ClimateLineAir™ heated tube ensures effective delivery of humidified air without rainout. Ambient light sensor automatically adjusts the brightness of the screen based on the amount of light in the room. Super quiet Easy-Breathe motor ensures a peaceful night's sleep without the incessant whine of a noisy CPAP machine. MyAir™ online patient support program provides helpful information and support during every stage of your treatment journey. By giving you access to your therapy data, it lets you continually track your progress and see how well you™re doing. An amazingly automatic machine that senses everything and records it onto a flash memory card. Its auto breathing technology makes it easy to put on the mask with less discomfort and no high pressure. It ramps up to your needs as you go to sleep. And, when you wake up, it reports how many hours you slept and how many incidents of apnea occurred per hour the machine had to correct while you were sleeping. Once you get used to the controls, the front display will light up only as long as it is needed for reading. Very simple to operate. Highly recommended. The Airsense machine is a nice compact machine compared to my previous model. The display features are nice. It will let you know how many hours you slept, how many events you experienced and whether on not you had proper mask seal..which is important to me. Great people to work with ..they have my business!! Great machine. Came already preset. Prompt shipping. Excellent price. I highly recommend you to buy here. My Dr's office sent me to company's who wanted hundreds of dollars more and in one case 5000 dollars for inferior a machine, Best Cpap price .com is just that the best!!!!!!!!!!!!!!!!!!!!!!!!!!!!!!!!!!! I was using the Phillips Resperonics Auto Cpap that was about 5 years old. I waited too long. This one uses a bigger and better filter that will not choke air and cause neg effects on sleep like the Phillips. The Airsense uses a humidifier tray that holds 55ml of water more than everything else on the market it seems! This was a big selling point. I have been told that my Auto setting on my old machines doesnt do enough to promote better sleep so I have been stuck with a Solid air setting. This machine seems to want to run my air needs about 3 less than my old machine on Auto. I think it did a decent job but went to a solid setting of two more. So far so good and will experiment more after i get acquainted better with this machine. The MyAir feature on the web is a nice overview and helpful if you need to make manual adjustments and are getting used to the machine for the first time. AHI is what you want to keep an eye on and keep low as possible so this graph is very helpful. Using an Aloha from Delvelviss for my big head and it is comfortable. The first couple days it would not auto shut off. This was a big complaint and Resmed statement was it could happen if not using a Resmed mask. Mine did start shutting off automatically. I found that my mask setting was on Nasel and not pillows after I checked again but I do not think this caused the problem at first. Overall I am very happy with Resmeds machine after a couple weeks in. I feel I am sleeping better with this humidifier and heated hose. I am extremely happy with Bestcpapprice.com They were helpful in making the purchase and have always provided great service! The Resmed Airsense 10 Autoset is the best machine I've ever owned. Switched from a BiPap to the Autoset model with the heated tubing, and I'm sleeping better than ever before. No more condensation with the heated tubing. An added bonus - the Resmed MyAir app helps me understand my sleep performance and make adjustments where needed. 100% satisfied with this machine! I purchased this CPAP as a second unit to keep at the beach so I didn't have to transport my other one; I like the machine that much. The heated tube is worth the extra price in my opinion and "best cpap price" had the best price and service out there. So glad I found bestcpapprice.com, they were over $200 cheaper than anyone else. My cpap shipped within an hour of placing the order. Couldn't be happier. Took out of box when got and plugged in and was ready to go. The CPAP machine work real good, I can finally get a good nights sleep. A: Yes, these are brand new with a two-year warranty. Was this answer helpful? 13 of 13 Customer(s) found this Answer helpful.